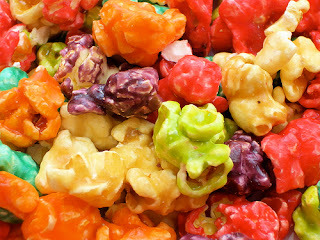 Fourth Grade Nothing: Rainbow Popcorn - An '80s Mall Treat! Rainbow Popcorn at the Mall! Back in the 1980s, my mom would take my little brother and me to our local shopping mall every Friday night. We'd enjoy dinner at the food court and spend our allowance on mall treats. I'd usually purchase some cheap makeup at a drug store or '80s accessories at The Deb Shop. Before we'd head out, we'd always hit this kiosk that specialized in popcorn and my most favorite was rainbow flavored. It was sweet and pretty and just so delicious. I'm craving rainbow popcorn right now. It's something you don't see often. Anyone remember it? I'm going to order it from Popcorn Palace! I remember it, but I don't think I ever ate it. Our "big mall" had a shop that sold it in the middle of the food court. Totally remember that...surprised I did not break off any teeth! What did they use to coat it? No - not sure it made it to the UK!